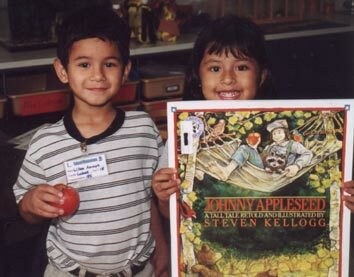 Students at Calvert Elementary School spent some time learning about Johnny Appleseed whose real name was John Chapman. Appleseed was an American pioneer from Massachusetts. He traveled westward planting apple seeds and spent his life planting and tending nurseries of apple seedlings over hundreds of square miles in what are now the states of Ohio, Indiana and Illinois. Appleseeds birthday is September 26. Calvert kindergarten students read books about Johnny Appleseed and other apple-themed books. They learned to sequence events, created prints of apples, and learned about the five senses-smell, touch, sound, taste, and sight-using apples. Pictured (l-r) are Natascha Labods students Wilber Amaya and ltzel Vasquez.